I remember this movie had a lot of positive buzz when it was out & I’ve been meaning to watch it for a long time, especially after I then saw Brie Larson in a couple other movies & thought she was pretty fantastic. I thought she was the actual highlight of the somewhat mediocre 21 Jump Street & even of that weird Don Jon movie (which is pretty impressive as she only had one line). Oh, and she was good in The Spectacular Now (probably should have been the lead instead of Shailene Woodley). Well, Larson is great in Short Term 12. I’m surprised she hasn’t yet gotten the sort of attention that Jennifer Lawrence did for Winter’s Bone. I mean, I think she did get a bunch of awards for it but she’s still not as famous as Lawrence. Hopefully she’ll get the right sort of role that gets her more recognition. And this might sound weird but, hey – I’m a girl & I like seeing girls who look like regular people in movies for a change! She’s cute, obviously, but not some freakishly gorgeous supermodel. 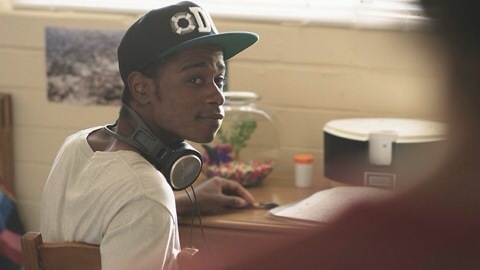 In Short Term 12, Larson plays a 20-something who works with a group of other young adults in a home for troubled teens. It’s a fairly heavy film but the characters are pretty well developed and you really do care about what will happen to each of them. You get to know several of the teens at the home but they mainly focus on the stories of two of them while we slowly learn more about Larson’s character’s background & how it affects her job and her life with her boyfriend, who also works at the group home. Her boyfriend is sweet & funny and they have what appears to be a great relationship. I’ve always said that I find it very hard to like a movie if I hate all the characters and Short Term 12 is the exact opposite of this. Even those who are in the home and are getting in fights, swearing & spitting at staff, etc, all have their reasons & just need people to be there for them. I liked everyone in this and hoped for a happy resolution for all of them. It’s not all “sad drama”, though – the boyfriend has a nice sense of humor & there are some heartwarming scenes. I was asked what other movies this is like and I couldn’t really think of one. Maybe something like Stand And Deliver and, hell, maybe even Dangerous Minds? But more “indie” and with a younger feel to it than those as everyone is in their early-20s or their teens in Short Term 12. I do think, if I’d seen this as a teenager, I’d have loved it & watched it over & over like I did with Stand By Me every day after school when I was 13. Great performances & characters make Short Term 12 a fulfilling movie experience. It’s a bit heavy & a little sad but manages to be uplifting as well and gives us characters we care about. It doesn’t feel contrived & the people in it feel “real”. The director wrote this after working in a similar home just like Larson’s character, which is probably why the movie feels so genuine. Yeah, I thought this one was pretty good. I liked Short Term 7 better. Was that the one directed by James Cameron?? No that was Short Term 9. Short Term 7 was directed by Andy Sidaris. Oh, that’s right. The only one I really hated in the Short Term series was the Wes Anderson one. 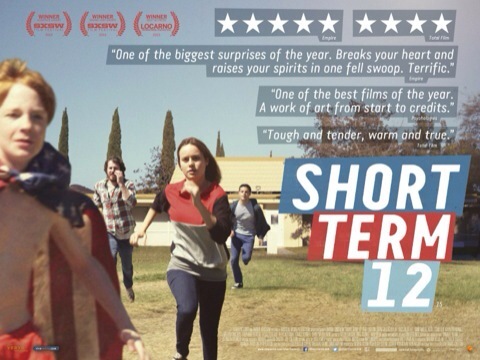 I liked but didn’t love Short Term 12. Sometimes the characters really frustrated me. Oops – I missed a bunch of comments on this post! That’s too bad you didn’t enjoy this one as much as I did. I suppose the characters WERE a bit frustrating at times but their abusive pasts gave them a reason to be that way, I guess. I’ve been meaning to watch this for a while now. Sounds like I should just get around to it! Nice review. A lovely little film that shows indie cinema has no boundaries. Good review. I think I’ll take the afternoon off and go see this! Wait – maybe I’m thinking of something else. Hello! Trying to get back into it but also trying to finish a duvet sized crocheted blanket, eat healthily (so time consuming! ) & half heartedly look for a new job! This sounds good and I agree I love Brie Larson, did you ever see her in United States of Tara? She stood out in that too. I miss that show! You should find it, I think you would like it, especially if you like Toni Collette. But the show did get unexpectedly cancelled, so I don’t know what that says about the show. A lot of good things get cancelled, though. 😦 Think it all started when My So-Called Life got cancelled! Sounds good! I didn’t even realise that Brie Larson is the girl from 21 Jumps Street, I really liked her in that. Got to watch this now. Definitely. I just watched The Spectacular Now yesterday and even in that she was very good with that limited amount of time she got.